Okay, so they aren’t my MiMi and PawPaw, but rather, the grandparents to my girls on Eric’s side. Their names are Pat and Ron, and today I get to share with you why I am thankful for them. First, they are the parents to my husband, and based on the outcome, I’d say they did a pretty fantastic job of raising him. Eric has followed in the footsteps of his father by living a life in ministry. They are both musicians and have used this gift to bring glory to God’s Name. From what I’ve been told, raising Eric as a boy wasn’t necessarily an easy task, but the prayers, hard-work, and time were all worth it. They are leaving a legacy through their son. Ron and Pat are also head-over-heels for their granddaughters. They both talk about the significance of their own relationships with their grandparents in their lives, and they seek to make the same kind of impact in my girls. As much as they can, they pour into the lives of these precious ones through time, gifts, and words of affirmation. 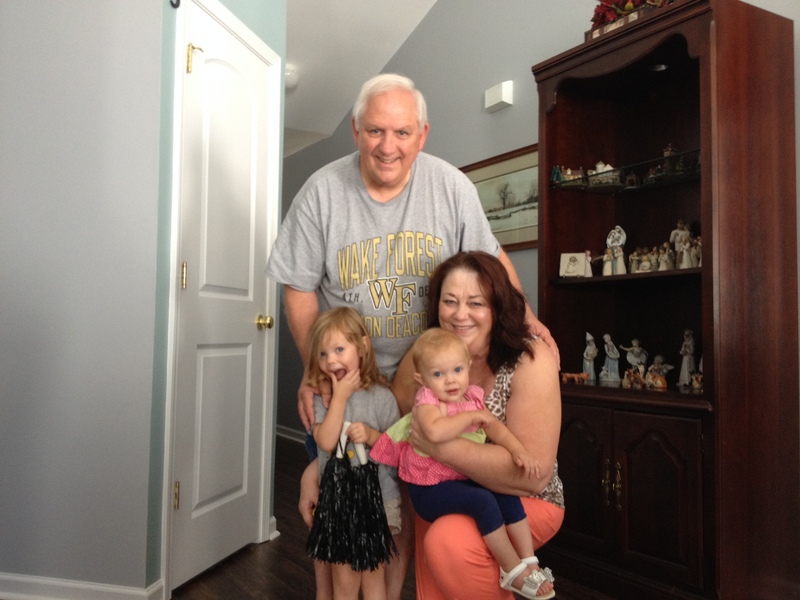 These little girls are loved deeply by many, and their MiMi and PawPaw are no exception. My girls regulary spend time with MiMi and PawPaw on Mondays so that I can work on this blog! One of the things I love about my parents-in-law, is their relationship with Jesus. They have lived through their share of struggles, but their faith in the Lord has been the foundation on which they have stood in every circumstance. Eric’s dad consistently writes devotionals that he sends out to loved ones. Eric’s mom regularly prays for others and I know my little family is often the center of those prayers. In fact, she talks about how she prayed for Eric’s future spouse throughout his childhood. I so appreciate those prayers and I wholeheartedly believe they are a huge part of why we have a solid marriage. Even when Eric and I were dating, I could see that Ron and Pat expressed their love through gifts. Any time I would see his parents, they would have a small gift for me. Sometimes it was clothes, maybe a movie, or something that reminded them of me. They continue to do this kind of thing for my girls. Their gift-giving has taught me the importance of loving through generosity. I tend to stress over what I should gift someone, but I am learning that it’s often not the gift, but the thought that makes a person feel loved. Pat and Ron, thank you for all that you do and for who you are. We love having you in our lives! Thank you Amanda for your words of affirmation. I truly believe you are a result of countless prayers for Eric to find a godly wife and you are that and more. You are a godly mother of our grandgirls, a helpmate in the ministry with Eric and an encourager to him which is so needed in the ministry. As you know, the wife of a pastor is a calling and without that calling from God, the marriage in the pastorate just does not work. I have learned to admire your love for God, Eric and your girls and in that order. You are blessed to have my son as your mate, but then I am a little biased. You are a gift to him and to us! We love you! Thank you for your kind words! Love you guys!